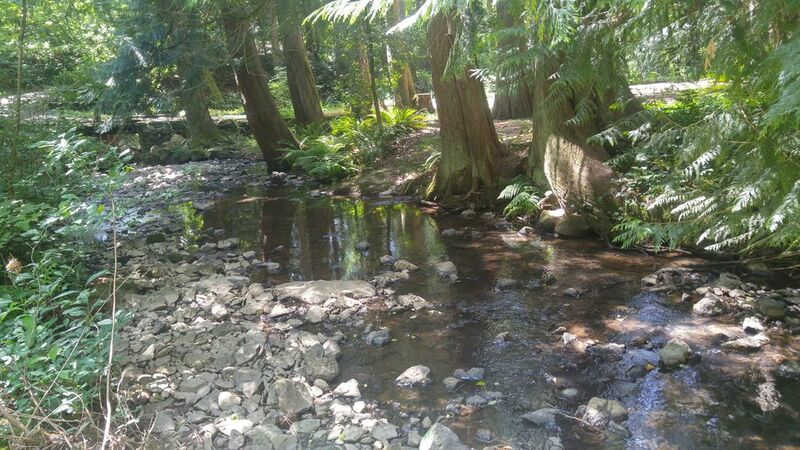 Our 2 acre property is surrounded on 3 sides by a nature park, has an easily accessed creek running through it, and is only 20 minutes drive from downtown Portland. Lovely, new, detached 1 bedroom 2 story, bungalow, 640 sq ft, with the main bedroom upstairs, and equipped kitchen & bathroom with towels/soap/shampoo downstairs. Satellite TV & wifi. Private patio, with BBQ, overlooking the forest and creek, & views of forest and gardens from kitchen and bedroom. 1/2 mile to most shopping, police/fire, and 2 1/2 mi to freeway, hospital, max light rail line(18 min to downtown) and Clackamas mall. Parking for several cars on property, steps to unit. Rural enclave in now upscale neighborhood. A native Portlander, Don, and a Russian/Armenian immigrant(Mary) returned from adult careers in California. Both with outdoor interests. Don, previously in the film industry, with medical, acting, dance, yoga teaching background as well, & Mary a catering business owner, kitchen supervisor, merchandising, and she also previously worked in her family's carpet sales business in Moscow. BA's in philosophy and psychology respectively. We wanted a larger property with some water feature that needed some attention to rehab its natural aspects. Now more than half the property is park like and improving every day. The house was listed as a teardown, but we decided it could be saved, both to save money and renew an old but still viable resource: a lovely home. Frogs, salamanders, deer, owls, and much more share our property. It's non-forest spaces, originally overgrown lawns, are being turned into orchard, vegetable fields and wildflower patches for wildlife. Clean air, relaxing forest and beautiful creek alone make this a great place to visit. However, the small farm is gradually producing sustainable yields, used for ourselves and guests breakfasts. All spaces are within feet of the forest. The property is also within a major metro area, allowing quick trips to any urban interests, and only a 20 minute drive into downtown Portland. And the larger Metro Portland areas is commonly listed as the best outdoor city in America, with 15-45 minute access to dozens of parks from local to national parks. 3 major rivers within 20 minutes. In Main house. Use by request is welcome. Full dining room in the main house for breakfasts. Over 1000 books, primarily non-fiction and reference, but also many fiction titles. Books, coloring books, puzzles, stuffed toys, dolls. Private patio for this unit overlooking the forest and creek. Separate, shared patio and deck with main house. There is a single step into the downstairs room, where there is both a bed and the kitchen/bathrooms, so with manual assistance or a temporary plywood plank a wheelchair can enter the downstairs. The dining room, in the main house, has a wheelchair ramp into it. While this is a single family home and outbuilding, it is within a few minutes of almost any city or outdoor activities desired, from symphonies to whitewater rafting, fishing & waterfalls to a vibrant food scene, even summer snowskiing. If you are looking for an out of the ordinary place to stay, please consider Scott Farm. We were recently there for a week and thoroughly enjoyed Don and Mary's 5* hospitality. Accommodations charming - loved the very retro decorations and furnishings (kinda like a central European inn or chalet). Great scenic and rustic trail to walk the dog and exercise. Grateful for breakfast items and gourmet coffee. If you're in the Portland or Happy Valley area, this is a great place to stay! An oasis in the midst of the development of Happy Valley. Particularly enjoyed the cedar trees, the creek and the access to walking trails. The owners were very attentive and left us lots of food. The apartment was clean. The place was otherworldly and a little overwhelming with all the little decorations everywhere. Great spot, great service, great people!! We needed a place in Portland close to family but that could also accommodate our dog. Scott Creek Farm fit the bill to a "T"!! Our dog loved the trails (as did we) and it was easy to get to our family. We had space to invite people over. We were too busy to cook but we did have that option. It was very warm most of the time and we chose to sleep upstairs so we really appreciated that they came in during the day to clean up and turn the AC on so we would sleep in comfort! We got a walk in in the mornings but then we were gone the rest of the day but this would be a great place for a retreat -- there are lots of books, games and then the trails, plus sitting outdoors -- we didn't have the time to enjoy all that like we could have. Mary and Don take very good care of you! They kept the frig and breakfast stuff well stocked and the cabin well cleaned. There were lots of nic-nacs so might be a little challenge for those with small children - but again, lots of toys and games for all ages. We really enjoyed feeling like we were out in nature while being in the middle of the city!! Very quiet, clean guests we highly recommend. The creek is beautiful, owners invited us to graze from the gardens, compelling kitschy stuff throughout property, unique in many great ways, kids loved it as did the adults. Don and Mary were so welcoming and accommodating. We were traveling with our two dogs and it was wonderful to find a place with so many trails and places to walk them that were also so private. Don and Mary also provided bagels, english muffins, yogurt, milk, and coffee for us - so breakfast was a snap. An unexpected and delightful surprise. We couldn't have asked for more for just a one night stay. We are located in a suburban area 20 minutes from downtown, and the Columbia river recreation opportunities, and an additional 5 minutes to most museums, arboretum, and gardens. The Columbia River Gorge National Recreational Park is 30 minutes away, Mt Hood wilderness areas and 365 days a year skiing are 50 minutes away. DIRECTIONS: Take the 205 freeway to Sunnyside road/Sunnybrook Dr, which merge. Go R on Sunnyside Road to SE 122nd ave, then go left or north. 122nd curves into SE 129th ave. We are on the left. No neighbors on 3 sides. Yellow house with Barn like garage. LED lined driveway at night. Additional fee of $15 per person over 3 people.